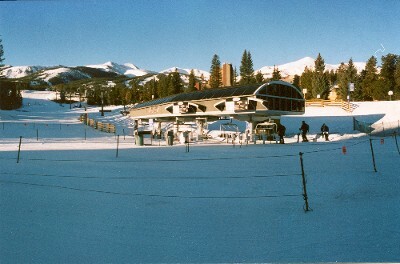 Of the many superlative ski options offered by various Florida ski groups, I select Breckenridge, Colorado. A place I've never been, and a place full of ski lore. The full-week trip package price is irresistible. We touch down at Denver International Airport and are greeted by the dry western air that feels warmer than the moist Florida air we have left behind. A large, luxurious bus takes us to Breckenridge, and we and our voluminous luggage are dropped off at the Village at Breckenridge Condominium Resort. Our rooms are at the "chateau" -- a rather appropriate name for what turns out to be an opulent condo unit that we are to spend the next seven days in. On our first day, I find myself at the top of a ski lift looking out on the Breckenridge village horizon. Before me, at an elevation of 13,000 feet, is a vast, gorgeous, arresting array of brilliantly white snow-capped mountain peaks. It is indescribably enchanting to look out upon such a stunning view as one skis the slopes. A Rocky Mountain scene that never fails to utterly delight me. To warm up after a year of not skiing, I select an easy "bunny" trail for beginners. Despite my year off, I quickly find my ski legs and skills (like riding a bicycle -- one never forgets…). Despite the nearly flat, dull trail I am on, I experience an overwhelming sense of euphoria. It feels so good to be skiing again! On this first day, I catch a glimpse of something I had never seen before on a snowy winter day: A full, glorious rainbow arching over the panorama of mountainous peaks. I soon learn, to my disappointment, that while Breckenridge is a vast, wonderful playground for skiers, many of the blue "intermediate" level slopes are not sufficiently challenging for me, and I must instead seek out the "advanced intermediate" trails at the Resort. This ends up as a non-problem. 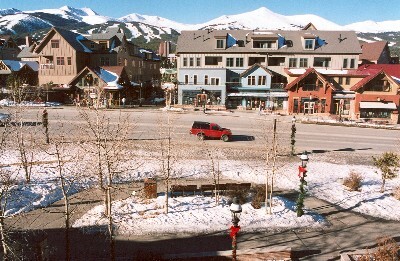 After all, Breckenridge boasts 3,400 feet of vertical rise over 2,200 acres of terrain. Terrain blanketed by an average of about 300 inches of powdery snow each year. I am pleasantly surprised to find that my skill level has taken a quantum leap forward since I last skied almost a year ago. I find that I now ski with a great deal of confidence, which boosts my enjoyment level. While the air and sun are warm at the Breckenridge base on Day One, riding up the lifts brings the skier into bitter, unforgiving, cold winds that leaves me with a first-day case of wind burn. At the end of our first day, we learn the sad and stunning news that an 11-year old boy not wearing a helmet slammed into a tree and died. On Day Two, we learn that "Peak 7" at the Resort contains the best selection of blue slopes. Especially enjoyable are Monte Christo, Lincoln Meadows, Wirepatch, Claimjumper and Swan City, five of the most fun trails among the 146 trails at Breckenridge. Each features a number of amusing dips and valleys that lead me to hoot with joy as I ski through them. And each allows the skier to travel at relatively high speeds in a safe manner for nearly the entire length. Indeed, there is little need to scrub off speed on these particular trails. 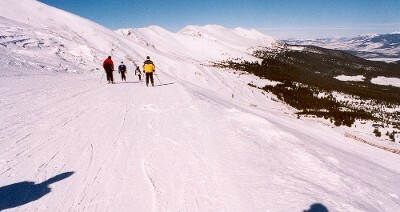 "Peak 8" contains blue trails that are relatively wide and relatively steep. Trails at Breckenridge tend to be well-groomed, which makes higher skiing velocities more enjoyable and feasible. The slopes and lifts at the Resort, as I was warned by a Florida friend, are relatively crowded -- particularly on the long weekend (MLK) we visited. At night, we attend the Florida Ski Council buffet. The enormous ballroom is jammed with over 600 Florida skiers. At times throughout the week, it would seem that most of the skiers are from Florida and not Colorado. To end the night, I visit the Breckenridge Brewery, order a pint, and discover that not only is the skiing very good but that the local brewery brews a mean oatmeal stout. The Brewery serves what appears to be a nice little selection of brewed-on-site micro-beers. On the third day, I shuttle to nearby Keystone Resort. The blues here are very steep, but otherwise unremarkable. At 2,900 acres, there is even more ski-able terrain at Keystone than at Breckenridge. Again, the panoramic, surrounding views of the snow-capped peaks took my breath away even more so than the 10,000-foot elevation I was sucking air in. The next day, I continue to take advantage of our universal lift ticket by shuttling to Vail Resort for a day of world-class skiing. Vail, for the fifth year in a row, has been rated the best ski resort in the nation. At 3,400 feet of vertical rise and 193 trails on an astounding 5,300 ski-able acres of terrain, Vail is simply overwhelming. The weather couldn't be better. The day of skiing, as is normal for Vail, was very, very good. Mind-boggling variety of trails, and high quality trails at that. For the first time ever, I decide to sample the famous Vail "Back Bowls." Incredibly, Vail has seven natural bowls stretching six miles wide. These bowls provide what appear to be virgin, little-used trails just over the peaks on the opposite side of the mountain faces. I spend most of the day at Blue Sky and China bowls. Also a first, now that I have confidence in my skiing ability, is skiing some black diamond trails (of course, I fell on most of these expert trails). The best trail of the day is Grand Review at Blue Sky. A blue trail that takes the skier through a beautiful pine forest where the trail gently curves through a scenic, groomed, quiet, uncrowded area. For most of the next day, I decide to again ski the outstanding Peak 7 trails. On my way there, I discover that the Spruce Trail on Peak 8 is a wonderfully fun ride. Upon arriving at Peak 7, I find myself repeatedly riding up the Independence Lift. Each time, I look up to the mountain peaks in front of me and see a "T Bar" lift slowly pulling skiers above the treeline into the heavens. Do I have the courage to go up there? On my first two rides on Independence, I decide that being left up there would be too fearsome. After all, the large red sign on the base of the T Bar lift loudly cautions that this lift is for "Experts Only". "I'm not an expert, am I?" All of the trails at the top of the lift are Black Diamond. No place to go for an intermediate skier who loses his or her nerve. But finally, on my third ascent up Independence, I boldly convince myself that it would be utterly foolish for me to squander the opportunity. My confidence level is up. And I am carrying my camera. What better place to capture the eye-popping, rapturous beauty of Breckenridge than at 12,000 feet in a place above treeline? Happily and with great relief, I safely hurtle down the groomed Pika trail at the top of the T Bar. Later in the day, I am on Monte Christo. At one point, now being a bit overboard and reckless, I shoot over a hill that I am unfamiliar with. I am surprised to suddenly discover that a steep drop awaits the skier on the other side. Unexpectedly, I find myself air-borne for about 20 feet. Having no prior experience in "catching air" while skiing, I ungracefully come down in a crash landing. But as is so often the case, a ski crash looks awful to on-lookers but is reasonably harmless (with the exception of one's ego) to the skier taking the fall. On my last day in Breckenridge, I begin by sampling a new activity: dog sledding. Good Times Adventures puts me on a sled led by a team of eight huskies -- all eager to do what they live to do, and that is to run like screaming banshees. For an hour, I trade off with two others to lead the team along snowy, narrow trails near the continental divide. We are instructed about using the sled brake (taking your foot off it can lead to a runaway sled…). We are told that we need to crouch low and lean into the turns the dogs take us through at sometimes frighteningly high speeds, to keep the sled from overturning. Soon, it becomes second nature, and I have a great time. 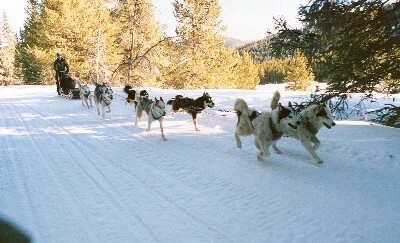 I also learn that it is "only in the movies" that the sled driver yells "MUSH!!" Actually, the correct dog sledding encouragement is "HIKE!!" After the sledding and after shooting pics of Breckenridge Village, a new friend on the trip convinces me that it would be unfortunate to waste such gorgeous weather by not skiing in the afternoon. We Floridians are only in ski country once every year or two, so why squander the opportunity? Within 30 minutes, I've rented gear again, bought a lift ticket, and am expectantly riding up a lift again to squeeze in a few more hours of skiing Breck. Overall, my comparison of the three resorts is that Breck has the most sedate blues and the best signage. Apparently, the Resort goes to great lengths to manage liability in a sport that is rife with injuries and lawsuits. Breckenridge also features unusually long trails, with the Four O'Clock trail the longest at 3.5 miles. Keystone has the steepest blues, the most primitive lifts and the most inadequate signage of the three (although their signs and lifts were adequate). 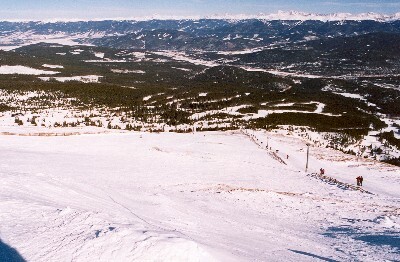 Vail, more so than Keystone or Breck, too often forces the skier to pole uphill. Vail skiers also find the need to ski a lot of boring traverse trails. And Vail has what must be the widest trails on earth. Despite these minor issues, I find Vail to be one of the finest places to ski in the West. And to add icing to the cake, Vail has the most charming, walkable, quaint village I've experienced in the United States. Will I return soon to ski Colorado? You bet.